Some people eat to live. We live to eat. When we came up with the business model for Eventure, the first hurdle was to decide which service we would implement. The business model calls for Eventure to build and own all event services under one roof, we actually own and operate these services, not just claim that we do and outsource the business. It made sense to start with catering and bar service. Bar service I already had a considerable amount of experience in, but catering was a new venture, and other than watch caterers work at events, I had no idea of how it worked. But like all eager entrepreneurs, I thought to myself “How hard could catering be?” I mean, I could troubleshoot and program an entire concert lighting system, making chicken breasts is a walk in the park in comparison….. How wrong I could be! Before I get into the little I know about catering, let me tell you how we came to be caterers. As our business model was built on the premise that we team up with like-minded new businesses, catering was the first step in that direction. 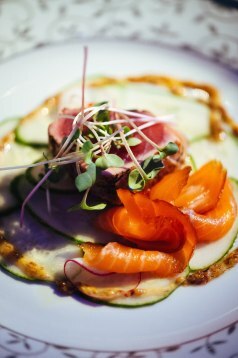 Most events, and I would say over 90% of events, incorporate food in some way at the event. It only made sense that catering would be our first division. At the time, every time I checked Facebook, I would see posts on David Sacks Catering. So I started the hunt for Dave, and it was impossible to get him to sit down and meet. I eventually tracked him down, and we spoke about both our businesses for hours, and it was inevitable, we were meant to do this together. Dave was working out of his apartment kitchen, and I couldn’t have been more impressed than to see the quality and amount of food he was able to produce out of there! But Eventure brought a team together, the ability to not only sell, market, support and finance a proper catering operation, but other sources of potential revenue to support it as well. After a few events together, it was decided to make it official and go out and get a kitchen. Kitchens are expensive, and to build one from scratch is a big endeavor. After searching, I found out that Java U catering was buying their own building and selling their existing kitchen. The timing couldn’t have been better, as Ronnie and Donnie were friends, and also I had worked with them many times over the span of my career. 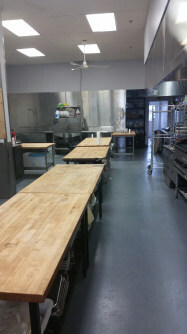 We made a deal, and we now owned our own commercial catering kitchen! With a lot of TLC, re-arranging and repairs, this became our new home. Now the learning had begun. Dave was and is an amazing chef, as well as a fun person to be around. He taught me so much about cooking, catering, shopping, pricing and I thank him for that. I always am amazed at how well chefs handle knives, and Dave showed me the basics, but I am not meant for finesse like they have. But I was committed to learning the business, because I feel that no matter what you do in business, you need to understand it as much as you can. I have and continue to do the shopping with the chefs, I work the line when I can, I have spent countless hours in the kitchen chopping, slicing and making burgers. It is no different that when I taught myself lighting, if you want to do something well, it takes time and dedication. I am by no means a chef, not even close. I have a lot of respect for what chefs are able to create, and how hard it is to do it, specifically for catering. But I do have a good foundation, and I now can create menus, shopping lists, figure out the rentals, price out the menus for clients, figure out the staffing, timing and scheduling, and even prepare a lot of the food too. And Dave was my first teacher in this world. I had the fortune of running into a great chef, Liam Hopkins when we were running WNT out of our kitchen. I coerced Liam into joining our little catering team, and for two years he was an integral part of our catering business. Liam for a brief period became our executive chef, and he brought a new sense of finesse and skill to our team. Liam is very passionate about precise plating, and he turns his dishes into works of art. When Park came calling, we now had to find a new Executive Chef. Fortune shined on us once again, and we got introduced to chef Ben Cooper. He was the executive chef at a few known West Island Italian restaurants, and I was a bit hesitant at the time, because I knew that I wanted someone in the catering world. But with everything, you take the time to meet and talk and you never know what can happen. What happened was that I meant this young guy at our office, and we started talking. Ben Cooper started working in kitchens at the age of 15 in Austria. He worked and studied at a 5 star resort for a world renowned culinary institute. He didn’t just study in a school, he studied in one of the most challenging and difficult environments possible. He has told me stories of how many older, more experienced chefs tried to succeed at this institute and failed. He was one of two who graduated at the end of the process! And believe me, his skill and passion is above and beyond anything I have ever seen. He understands how to produce incredible, delicious, beautiful dishes, time and time again. His first event for us was a kosher wedding for a very demanding client, and did he ever impress, and continues to do so to this day! I look forward to the new year with Ben, and to really introduce what we can do for our clients. Also, we work with George and Ronnie for all of our staffing needs. I cannot say enough about them and their company. We would not be in catering without them, and I mean that. Working with them makes us a great catering company, they are so hard-working, experienced, organized, level headed and passionate about the events, that they truly treat our events as if it is their events. They bring class and sophistication to every event, and they make sure that we shine. They have elevated our game beyond our abilities, and for that they will always have my loyalty. A lot of people ask me about the business side of catering. How do you calculate food cost, how do you know how much to charge, how do you figure out all the rentals you need. The answer isn’t as simple as they hope it will be, like we have a magic formula and it spits out the information. It really takes years of trial and error, of doing it over and over again until it becomes part of what you do. What I can say is that to be a good caterer, you really need to know that it’s not just about penny pinching, but rather setting a certain standard, no matter the cost, and allowing your skilled chefs to be able to deliver a superior product. Food cost is the one thing that a lot of people ask me how we figure out. Over the years, we’ve made it into a challenging game here to see how close we can get, and to see if my pricing is in line with the executive chefs pricing. I am happy to say that most of the time we are pretty close on both! But figuring it out is no more than taking the menu, breaking down each item to all of it’s ingredients, knowing the market cost for these items and totaling it up. I always smile when I see some young newcomers to the food business at the market or Aubut with their lists running up the aisles writing the costs of all the products so they can figure out food costs. I don’t think it ever need to be that exact, but I am thankful that we know the costs, for the most part, and we can do it from the comfort of our office. We don’t really work with too many distributors and suppliers, like most restaurants would do. We go out and hand pick what we are using. We shop at Aubut (for those who don’t know, Aubut is where most food service companies do their shopping), the markets, Adonis, La Mer for fish, Canada Wide (for large veg orders) and a host of butchers, and meat distributors too. In today’s world catering is very competitive, and especially in Montreal the bar is set very high. We are known as a world class restaurant city, and we have always been known as a world class event city. But there is a difference between being an event caterer and someone who offers catering. I see signs in almost every restaurant, bakery, fast food restaurant, cafe that says they cater. Making a platter of sandwiches is a part of catering, but that isn’t event catering. Event catering is where you can seamlessly feed 500 guests the same extravagant and detailed plate, served hot, fresh and delicious each time. To be a good event caterer you need to be a 5 star restaurant on wheels, every time. 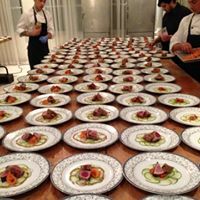 I have been to events and tradeshows in the U.S. and there are a lot of trendsetters there too, but my experience has shown that Montreal specifically has, and continues to be, true trendsetters in the catering world. 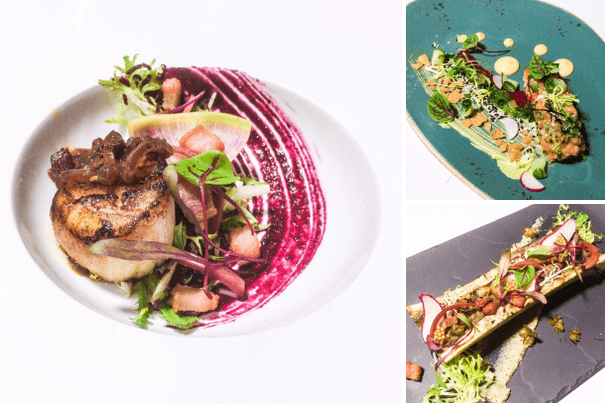 I look up to a lot of the longstanding catering companies in Montreal, and I look forward to our continued growth and success in the years to come. Please let everyone know about Eventure catering, and I assure you that you will be impressed with our quality, presentation and service. Catering had a large learning curve for me and it’s had its ups and downs. I remain very passionate about maintaining a certain standard for all of catered events, and our team is getting stronger and growing. If you are interested in the world of catering, we are looking for a strong catering manager. Feel free to reach out to me if you or someone you know is interested. Till the next blog post!